Any roofing system that uses plants could be defined as a “green roof”. These plants range from moss, lichen, sedum, trees, shrubs, flowers and bushes. The practice of roof planting in Europe is at its most technically advanced in Germany where green roofs have been fundamentally divided into two categories, “intensive” and “extensive”. Intensive green roofs are roof gardens and like any garden provide space for people. 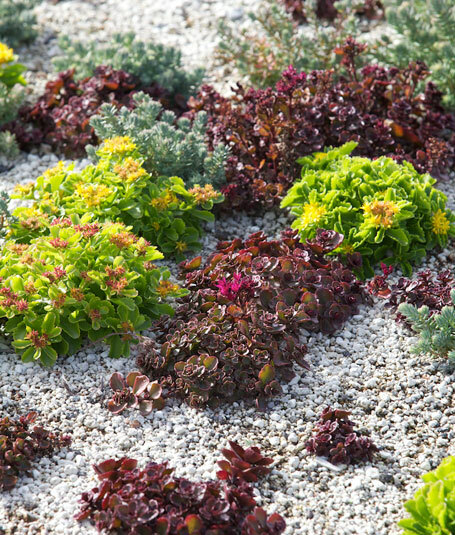 They require the same intensive management as a ground level garden, are usually based upon a thick soil or substrate layer and require artificial irrigation. Preferred plants are selected and the roof conditions created to support them. They are heavy systems and so can have major structural implications for the building. Extensive green roofs are not usually recreational (although extensive planting can be integrated with intensive systems). Plants are selected that will succeed with only minimal modification of the normal roof conditions. Planting styles are very natural with the aim of establishing a self-sustaining plant community on the roof. Based on a thin layer of soils or substrates, they are lightweight systems with minimal structural implications for the building. The main reasons for installing an extensive green roof are stormwater mitigation, visual appeal, reducing the environmental impact of the building, creating habitat for native flora and fauna, and enhancing building performance. Greenroofs Ltd can offer both of the above options using both exotic and NZ native plants.